A pair of six foot Tommy silhouettes will be ‘guarding’ the players’ tunnel entrance at Principality Stadium on Saturday, when Wales take on Australia. They are part of the 'There But Not There' initiative from the charity Remembered, as the country marks 100 years since the end of World War One. 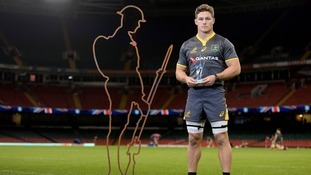 As well as the two six foot soldiers, thirteen smaller perspex Tommies have been inscribed with the names of those Welsh internationals who died during World War One. The Tommies are a fitting visual tribute, evoking remembrance for the thirteen fallen Welsh internationals, and I’m delighted to receive them on behalf of Welsh rugby. As well as featuring ahead of the men's match, the six foot Tommy silhouettes are also part of the women's pre-match remembrance, as they take on South Africa.